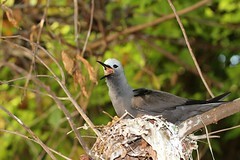 Seychelles is internationally important for seabirds, with 18 breeding species numbering millions of individuals. For over 30 years conservationists on some seabird islands have been conducting research programmes and undertaking censuses, however large knowledge gaps remain. With this in mind Nature Seychelles with backing from the Norwegian Embassy and Airtel Seychelles launched the Seychelles Seabird Group. The aim was to develop a coordinated plan for the management of seabirds by supporting seabird group partners, providing training and co-ordinate surveys and research. The SSG produces a newsletter containing news on seabird group activities, reports from members’ islands, study methods and technical articles.